Few things say ‘summer’ more deliciously than a warm freshly-picked tomato straight from the bush. Tomatoes are one of the most popular fruits with gardeners: simple to grow, tomatoes are relatively resistant to disease, produce an excellent crop and, home-grown, taste far better than the average commercially-produced varieties. Tomatoes flourish best in fertile soil and they appreciate lots of warmth. In a poor summer you can still get a good crop, which will be useful for tomato sauces, but without the heat of the sun tomatoes just don’t have the same sweetness and flavour. You can choose from indoor and outdoor varieties, and between beefsteak, normal and cherry tomatoes. Some are more disease and bug-resistant while others offer more flavour. There are the traditional tall-growing tomatoes or you can choose from a selection of bush and dwarf varieties. It depends on how much space and what conditions you have. Some of the most popular varieties of tomato that you’re likely to find on sale in garden centres include Alicante and Moneymaker, which have been in favour for many years for their reliability and good cropping. The tastier cherry varieties Gardener’s Delight and the orange-coloured Sungold have come into their own more recently. 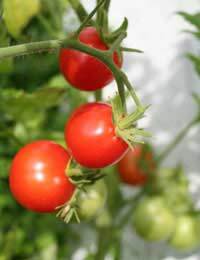 If you want to grow a specific tomato from seed you’ll probably need to visit the websites of nurseries. If you start early in the season and plan ahead you can grow tomatoes from seed; if you leave it a bit late you can still buy plants from garden centres and grow from those. Sow seeds indoors from mid-March to late April, planting a few seeds just below the soil surface in a small pot. Use a good seed potting compost. Tomato seeds are usually fairly reliable but plant a few more seeds than the number of plants you want to end up with to allow for non-germination. Cover the pot loosely with clingfilm, stand the pot in a saucer of water and keep in a warm place. A propagator is ideal for germination as it provides mini-greenhouse conditions. Simple propagators are available cheaply from any garden centre. The first two leaves that appear aren’t true leaves so wait until the next set of leaves have grown before you carefully transplant the seedlings into their own pots. As they grow you can transplant them into bigger pots if necessary until the first flowers have appeared. Then it’s time for them to be in their final position. If it’s getting late in the season and no flowers have appeared, plant in final position anyway in case the plant has become rootbound. A highly recommended and simple method of growing tomato plants is to put up to 4 in a growbag. You should get excellent results with minimum fuss. When the first fruits begin to appear it’s time to start feeding them with a specific high potash tomato food. Best results are achieved when the tomato plant is kept watered and is in a warm, sunny, light, position. side-shoots, which on tall-growing plants should be picked out to allow only one main stem to grow. It’s not necessary to pick out side-shoots on dwarf varieties. Naturally as they are straight from the bush into your mouth. Or in salads or sandwiches. If you find you have too many to use immediately make up a batch of tomato sauce for freezing. Peel and roughly chop some onions. Fry in olive oil until transparent. Add a clove or two of garlic, roughly chopped, and fry for a moment longer. Add ripe, chopped tomatoes, freshly ground salt and pepper to taste, and bring to the boil. Simmer until you have a thick rich sauce. Use immediately or freeze. Add herbs, chopped chillies or spices to taste. I have found this site extremely interesting and informative. I started browsing to find out about avocados, then read more and more. Brilliant site, thankyou.